DARIEN -- Fairfield Ludlowe's first-ever volleyball win over Darien on Saturday afternoon has sent the Falcons to the CIAC Class LL semifinals on Thursday where they will meet top-seeded Cheshire. The undefeated Rams, who advanced to the Final Four on Saturday night by defeating Amity in straight sets, eliminated Ludlowe from the 2012 tournament in a five-game semifinal. The No. 5 Falcons beat No. 4 Darien in the quarterfinals Saturday by scores of 25-18, 25-22, 17-25, 21-25, 15-11. Ludlowe improved to 19-3 overall, while Darien, which won the 2012 state championship over Cheshire, finished at 19-4. The Blue Wave had defeated the Falcons in every meeting since Ludlowe opened in 2005. Darien beat Ludlowe 3-1 on Sept. 25 in Fairfield. "I'm so excited, I can hardly breathe right now," said Ludlowe captain Casey Boatwright, who was a monster, particularly in the first, second and fifth games, all wins by the Falcons. "I've wanted to beat them for so long. The mistakes we were making, mentally it was getting us down and when we play that way, we're going to lose. We knew we had got to get out of it and play together and win," said Boatwright, who paced the Falcons with 19 kills, 10 blocks and seven digs. "When we are playing our best, I feel no one can beat us." Ludlowe's level of play might not have been any higher all season than in the first two games. But the Falcons were a bit sluggish in Game 3 and made more mistakes, mental errors and miscommunications by a wider margin than in the first two games combined. Ludlowe snapped out of its malaise for most of Game No. 4 but by that time, Darien was riding its momentum to the fullest. The Blue Wave looked confident, led by sophomore Isabelle Taylor and juniors Claire Naughton and Celia Matzolf. In the deciding fifth game, Ludlowe responded to the challenge of coach Meghan Skelton following the loss in Game 4. "I told them we're going home after this game either way," Skelton said. "I said make a decision on what you want to do, and go out and do it." 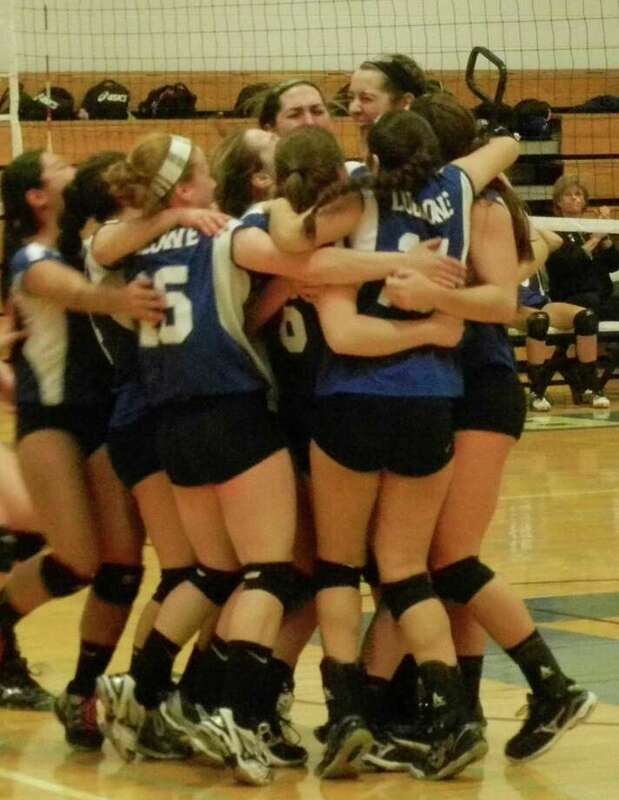 After Darien jumped to a 2-1 lead in the decisive first-to-15 Game 5, Ludlowe rallied. A Boatwright kill and service ace by Corrinne Lang gave the Falcons a 3-2 lead. A Boatwright block and a failure to return by Darien gave Ludlowe a 5-2 lead, and the tone for the final set had been established. The Blue Wave tied it at 7-7 but the Falcons responded by reeling off four straight points, featuring a kill by Lauren Schreiber, a block by April Cooke and a kill by Cook. Then with an 11-7 deficit, Darien began the first of its final two pushes, cutting it to 11-9. From there, a long serve by Darien made it 12-9 and the Blue Wave not returning a serve by Alice Nelson opened Ludlowe's lead to 13-9. The Falcons' defense and hitting faltered for one point each before Boatwright's kill at 14-11 ended Darien's season and moved Ludlowe into the Final Four. "I don't know if I can quite believe it yet," Skelton said of the elusive first win over Darien. "Casey is one of the best players I've ever coached -- she's unreal. She's stable. She's confident. She's our go-to player. Today, she made all the difference in the world. "I think we're ready," Skelton said in contemplating a semifinal rematch with Cheshire (25-0). The Darien coaching staff declined comment after the match. Records: Fairfield Ludlowe 19-3; Darien 19-4. Highlights: FL--Casey Boatwright had 19 kills, 10 blocks and seven digs. Corrinne Lang had 39 digs, seven service points, three aces and two kills. April Cooke had 17 kills, six blocks and three digs. D--Isabelle Taylor had 16 kills, five service points, four blocks and two aces. Claire Naughton had 15 kills, six service points, three blocks and two aces. Celia Martzolf had 35 assists, eight service points and one block.